This healthy & easy-to-make breakfast combination will leave you feeling satisfied and ready to go in the AM. 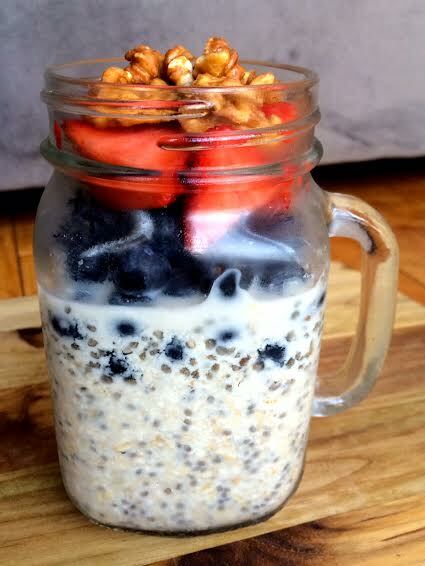 Recipe: combine 1 cup almond milk, 1/2 cup raw oats, & 1 1/2 tbsp chia seeds in a mason jar. Leave in your fridge overnight. In the morning, top with your favorite fruit to make it sweet and you are good to go! Looks wonderful! I posted with the same title a while back, but somewhat of an alternative (http://fitnessontoast.com/2013/11/26/breakfast-salmon-poached-eggs-on-toast) . Love the look of yours, will be giving it a try!